Merry Meet! Welcome to the Magickal Protection issue of the Silver Chalice Wiccan 'Zine! This is the busiest season for me, with new students enrolling in the Wicca School every day and getting everything rolling for the 2017 class. There's also an exciting new project in development... if you're interested in magick, check out the Events & Announcements column, below! Still, I've been making a very determined effort to keep up with all the emails and messages, and post in social media regularly. Which brings up something I'd like to tell you about. The other day, in a mad rush to find something to post of interest to Wiccans, I made a poorly-thought-out choice. I posted a graphic that showed Nature labelled as an anti-depressant, and a jumble of pills labelled basically as bad for you. I have never had such a vitriolic response to anything before! I didn't take it personally, really. I knew it was a lot of pain and frustration and grief finding an outlet. But it was a terrible feeling, to have inadvertantly hurt so many people who've had serious struggles with health or mental health issues. Beyond this rational perspective, however, was the energetic of it. A LOT of hostile energy was being projected very intensely at me. Being incredibly sensitive to energy, especially since I'm ill and struggling toward health anyway, it was really dangerous for me. The thing I like best about this new technique is that it doesn't return harmful energy towards those who sent it, as some magickal shields do. I knew the people who'd sent it didn't really mean me harm, and they were hurt enough  I didn't want to increase their suffering a jot! On the contrary, I wanted to help them as well. So, besides sending angels to help each of my "attackers," this new method helped heal and transmute at least some of their negative emotion/energy. I'm excited about this, because it's ideal for what's going on in the world today! The Earth needs as much negative Energy cleared away as possible, and this is a great way to not only avoid contributing to that Shadow ourselves, but to start clearing it from the world at large as well. Check it out below, as part of this special, magick-themed issue of the Silver Chalice! And have a very happy Imbolc! Magick Course In Progress What Really Is A Magickal Shield? The long awaited Magick book has been re-created  it's now an online magickal training course! After long consideration, I've decided to offer smaller courses rather than a whole 'nother year-long course to complete your 2nd degree Wicca Spirituality training. And the magick course will be the first one. It should be ready for launch this Autumn or Winter (Goddess willing). Stay tuned for more developments. I'm so excited about finally completing this! If you've been following the Silver Chalice, you may know that I've been working on this for many years. It's thrilling to be nearing the stage where I can actually share this world-changing information with you!! The magick course will build on what you've learned in A Year & A Day: 53 Weeks to Becoming a Wiccan, taking those skills and learning how to apply them to successful magick-working. For the benefit of all beings, so mote it be! 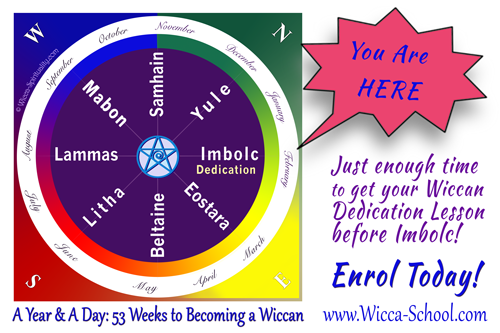 The second announcement this month is that A Year & A Day: 53 Weeks to Becoming a Wiccan has been revamped and enhanced! It's the same course, but with added stuff  extra tidbits, tips on how to get the most out of the course, reminders, some bonuses, and lots more interconnection between us. It promises to be an even better experience than the original! Want to Join the 2017 Class? It's Not (Quite) Too Late! The third new beginning is yours, rather than mine  beginning your Wiccan training. It's not too late to join the 2017 that A Year & A Day: 53 Weeks to Becoming a Wiccan class! Imbolc is tomorrow, but I could send you the Dedication lesson right away, so you could still be in time to do your Wiccan Dedication at the traditional time (that is, on Imbolc). The catch is, it means that you'll need to rush through the early emails and do the first few lessons quickly! The benefit is, if you were to catch up, you'd receive the lessons in sync with the Sabbats, and you can go through the training in alignment with the Sabbats. In other words, you'll get the Samhain lesson shortly before Samhain, and the Yule lesson shortly before Yule, rather than after the Sabbat has already gone by. And you'll study the Elements in their appropriate season. 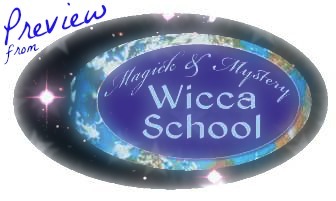 This is, I believe, the best possible way to learn Wicca, and it's how the course was designed to be experienced. If you want to learn Wicca this year, or deepen the spiritual aspect of your Wiccan practice, A Year & A Day: 53 Weeks to Becoming a Wiccan is the best way to learn!
" All the books I've purchased and read do not hold a candle to what I've learned thus far." "Before taking the course I bought every book I could find about Wicca but was unable to make the mish-mash of information make any sense. You have put together a puzzle that has stumped me for a very long time. Very enlightening experience." "Where you excel in comparison to others is the content in each lesson which I can only describe as outstanding and fascinating, so very well explained, so easy to understand. Your lessons are a joy to read and makes you hungry for more." "The best training course I've ever seen. Your details are amazing and so helpful." "There's been so much information that I've been unable to find, or contradicting info with no basis for my own interpretation. This is such a life saver!" "I spent years searching and reading many, many books. What I got was a lot of information I didn’t know what to do with, or how to use. That has all changed. Incorporating your teachings into my spiritual practice has been easy and joyful! You and your school have been a true Goddess send to me!" "Your info on Spirituality alone is more complex yet concise and easy to understand than any thing I have read in a book or on the web from any religion, and I have been studying Enlightenment and Religion for more than 15 years"
"You have a magical way of enlightening your readers"
"Everything is explained clearly and I'm not left second guessing, like with so many books/sites I have read." "I read and read books about Wicca and magick but I am not sure how to start... your lessons have helped and made me feel welcome and at home." Do you need magickal protection? Do you feel like your life is cursed? Or suspect someone has put a curse on you? There is a lot you can do to protect yourself! This article discusses basic self-protection that will help no matter why things are going wrong in your life. If your life is going sour, read on. If you think that someone has, or might, cursed or put an evil spell on you, you need to know how to protect yourself from that harmful energy. Some people (who don't know how dumb an idea it is) do cast evil spells on people. By definition, these people are not Wiccans, since Wiccans "harm none" and know that they hurt themselves more than they hurt anyone else. You don't need to be Wiccan to protect yourself, either. Highly sensitive people and Energy Healers are particularly susceptible to illness of body, mind, and emotions. It's because you are bombarded daily with energies that affect you. And because you don't know how to keep yourself from energetic harm. So you must take action to protect yourself! These are not skills that our culture teaches, because our society is ignorant of energies and the needs of highly sensitive people. It is crucial for you as a highly sensitive person to take care of yourself in the onslaught of these energy fields. And it is vital for you as an Energy Healer to learn command of your mind. Here's a handy new shielding technique to add to your magickal protection repetoire. It's a way of uplifting and transforming hurtful energy into Divine energy, like transmuting knives into flowers. I call this the Elevator Shield. If someone is spewing a lot of negative energy your way, this is a beautiful way to deal with it. It not only protects you from absorbing and being influenced by that energy, it helps heal and transmute the sender's negative emotion/energy. So if someone is sending you negative energy and you don't want to increase their suffering by sending it back to them, what can you do? How can you protect yourself without hurting them more... or increasing the Earth's burden of destructive energy? Just a quick alert that the sliding scale for A Year & A Day: 53 Weeks to Becoming a Wiccan may be phasing out. 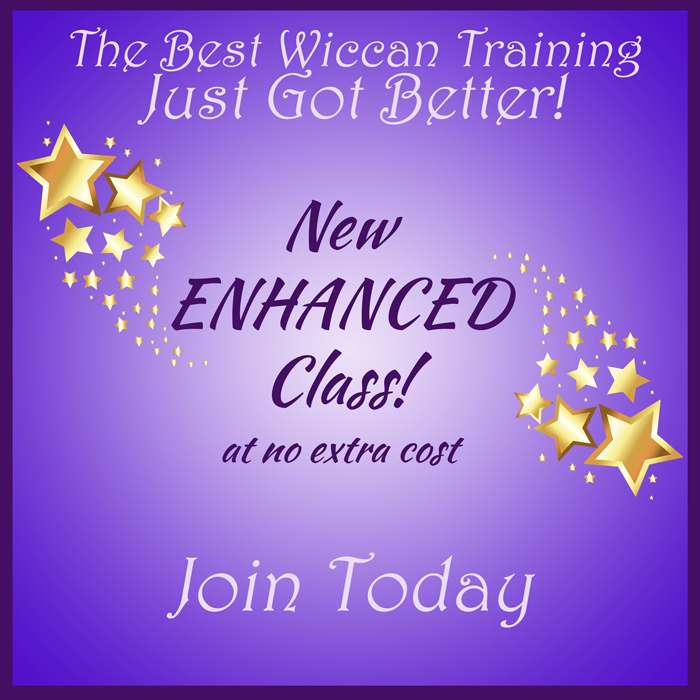 I started it because so many people these days are having a hard time making ends meet, and so many new Wiccans are young or disabled and on limited incomes... and I wanted to make the Wiccan training affordable to as many people as possible. It's not working out quite that way, though. 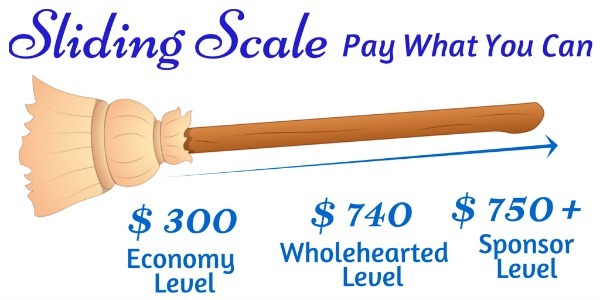 A lot of people are confused about how a sliding scale works. I've found that many people think the paying full price is entirely optional. Even when they could afford it, maybe by curtailing other expenditures, too many are choosing to underpay instead. One person actually applied for a scholarship  she didn't have money for the course because she'd just bought a new ATV for the family! This is when I realised that people don't seem to understand what the sliding scale is for. It's meant to be for people with no other options... people who are on subsistence-level incomes, who honestly could not take the course if they had to pay the full price. I'm happy to give this training at a lower price to those who really need it, because I don't want anyone to miss out. And yet, it's out of Resonance to be subsidizing the majority of the Wicca School students. It's out of balance with the often-overwhelming amount of work required to run the school, and the fact that I'm barely scraping by myself. I can't think of a good way to explain how this should work. So the only thing I can think of is to go to setting a regular price for it, like others do. Just wanted to share with you the reason why I'm thinking of cancelling the sliding scale option, and to give you sufficient notice that's it's not an unpleasant surprise. What Really Is A Magickal Shield? A magickal Shield is an Energy boundary that you build around yourself. Its purpose is to keep negative Energy from entering and infecting your Energy Field (that is to say, your body/mind and thus your life). Shields are usually seen as oval or round, like a bubble that completely surrounds you and travels with you wherever you go. This info is a prerequisite for the Magick course, so it's a preview into both. They can be made as thin or as thick, as permeable or impenetrable as you desire. They can be just outside your skin or beyond your reach, but more usual is at the distance of a normal aura... at roughly arm’s length all around you. There are probably dozens if not hundreds of ways to Shield, so the methods given here aren't meant to be The Best And True Ways, but they're easy to do and suitable for most needs.
. . . Continue . . . Starting off, I'll say that I'm very in-tune with feelings and what's going on around me beyond my own two eyes. Some of the people who I tell about it call it being an empath, others being psychic, others tell me I need to visit someone to get a psychological evaluation. However I've suppressed it most of my life because its a nuisance at times. I recently visited Salem, MA. I purchased Tarot cards, a list of victims of the trials, and a pentacle. When we got back to [my brother's] apartment he decided to mess about with the Tarot cards. Started normal... however thinking back on it, as soon as the pentacle and Witches list hit the table, things got weird. Basically my brother (a skeptic), all of a sudden his Tarot readings were extremely accurate. Scary accurate. The first one or two I brushed off, however when he decided to do a "random" layout with no pre-determined meaning it hit me. To start I all of a sudden got extremely dizzy, then another thing to note would be the fact that his "random" layout was an actual lay of cards used in readings. I believe that my brother channeled the spirit of a very old witch. So on the walk home, I kept getting this feeling of someone being by me. Not right over my shoulder but someone else around me watching and whenever I would look in that direction, there would be nothing. I just blew that off as nerves at first, but when I got back more things happened. First when I was in the bathroom  images flashed of a younger woman, with dark blonde hair, and she was mumbling. At that point I knew something was going on. Then I went out to the couch to relax, but that feeling of someone being there was still apparent. I walked to where I felt something and I got an immediate feeling of electricity. Walked away because I didn't want to do what I call "opening the flood gates". Of course there were a couple more times I got the image flash, but I eventually was able to make it stop. As write this now I feel the same feeling of uneasiness and get the occasional brush on my hands. The main reason I'm telling you this is because I cannot tell if she's going to be malevolent or not, but she's quite adamant on making herself known. I believe its a non-malevolent thing, however it is my brother and it worries me. With that said, if she's non-malevolent I might as well keep her around and give her the attention she wants. As for my brother, his skepticism is along the lines of disbelief yet opening himself and inviting anything around. It is within the realm of possibility that your brother was channelling someone, but it’s FAR more likely that he’s just a natural at reading Tarot. They are designed to be accurate, after all. And the layouts are often fairly instinctive. As for the pentacle and list of murdered Witches, these aren't likely to have any effect whatsoever. Neither is a doorway into the spirit realm... at least not without active intention and magick to activate them. Every woman who denied being a witch was hanged. Every woman who confessed to witchcraft lived! Don't ask me why  it's likely that the legal reprieves had a lot to do with this. And while people have a lot of superstition about Salem, it's actually just a town like many others that killed people as Witches. It's only real distinction is the level of out of control scapegoating that led to an appalling number of wild accusations  including against anyone who opposed the trials ("obviously, only a Witch would question the trials of Witches"). The public shock over the wave of hysteria that led to more than 200 accusations and 20 deaths spurred the USA toward abolishing Witch trials and limiting the power of religion in civil law. So, yes, what happened in Salem is remarkable, if horrendous. No big supernatural witchy ghost-y power about it, though! Even so, let's consider that your brother may have been channeling. There’s no inherent risk in channeling information from outside sources. Generally, most intuitive channeling is not of a specific soul, but the Cosmic Mind, or Akashic Records if you prefer. It's not smart to make yourself a target, of course, by inviting a spirit in. It doesn't sound like he did anything to call in a spirit. And from the rest of your story, he doesn't seem to be affected. As a sceptic, he’s unlikely to open himself to such experiences again, at any rate. Another big misconception, thanks to generations of dramatic story telling, is that a spirit who gets a hold of you has a lot of power and is hard to get out. The reality is that, despite everything you've seen and read in fiction, human beings are far more potent than spirit beings. If you tell them to leave, with conviction and certainty and ideally the assistance of your Allies, they must leave. From what you've described, I doubt she’s malevolent (most spirit aren't, anyway). She sounds like she does want some attention, though. I don’t know if you want to get rid of her… I think you’re implying that you do. It's nice of you to consider keeping her around, but it's probably not merely attention that she's looking for. Most likely she either has a problem left unresolved that she wants help with (possibly far too long ago to do any good) or she’s lost her way and doesn’t know how to get beyond this plane. Especially since she really seems to be trying so hard to communicate. What I mean is, she’s more likely to want help than company. This assumes that you have some experience with magick already. If not, I highly recommend that you either get some help from someone with experience or learn to do these things properly before attempting it yourself. Presumably there's not much you can do, if she wants help with something on the physical plane, if only because you don't know what it is. If she's lost between planes, though, you can help her find her way. Light a candle outside of the area that you will designate as sacred space. Cast a strong Circle, after lighting the candle, and exclude it from your Circle. Of course, this includes inviting the Elements, as well as any guides, guardians, deities, angels, etc. that you like to work with. If you don't have any, or even if you do, I recommend calling on Archangel Michael, who is extremely powerful and adept at this kind of work. Light a second candle inside your Circle, asking your allies to be there and keep you safe and clear from others’ energies. Ask them to tell the girl very firmly and lovingly that it’s time for her to leave, as you do the same, with blessings... and ask them to guide her to follow the Light in the outer candle to her spiritual Home. When you sense that she’s gone through into the Light, thank them all and open the Circle. Once she's gone into the Light, she can't  or won't  return to this plane. Extinguish the outer candle, with thanks to the Divine, and then the inner candle. It's also a good idea to cleanse the energy of your home and yourself, after, to remove any links that might possibly remain. Smudging is always good, in my opinion, but you could also rub sage leaves on yourself and your altar and doors/windows/mirror edges, or sprinkle salt around, or use sound (bells, drums, tambourines...) to shake up and clear the energy... or any other cleansing practice that works for you. Magic is the art of changing consciousness at will. Nothing is totally impossible. Miracles are just events that are extremely improbable. To attempt to manifest what you want, without passion, if it’s dead inside, is like dressing up a corpse. . . . . of all hindrances to Magickal action, the very greatest and most fatal is unbelief, for it checks and stops the action of the Will. Even in the commonest natural operations we see this. No child could learn to walk, no student could assimilate the formulas of any science, were the impracticability of so doing the first thing in his mind. I just wanted to thank you for taking the time and energy to put this wonderful site together. I was raised Catholic and as I've grown older, I've gradually drifted from the Church and tried to come up with my own alternatives to spirituality and worship. It was a shock to find so many of my own beliefs and ideals laid out in one place, especially when I'd grown up thinking Wicca was evil. Finding your site was a whim I never expected to come to anything, but now I feel like I've been brought here for a reason. I've always wanted to be close to God, but I always felt like I never truly could be unless it was through a man. I never understood why God couldn't be a Goddess, and all I've ever really wanted was to feel connected to that Mother aspect. Not really possible when women seem to be second class, let alone divine. I still have doubts, and I'll admit there is still some fear, but for the first time, I feel Her. It's only a step, and I've so very much to learn, but thank you, from the bottom of my heart, for helping me to find that path. It feels like I was working towards it all along, but your site was the direction I needed. Thank you. I really can't begin to describe how much it means to me. Thank you for taking the time to put your class together. I'll be enrolling for that Friday. Thank you for showing me and so many others that there's another way. I'm excited to learn all I can. I think the Energy Field going on these days is pretty clear to everyone, in one way or another. It's intense; it's ugly; it's scary! Even to talk about it is likely to trigger intense emotions... because it IS about intense emotions  the most intense emotions humans have. Anger. Fear. Despair and powerlessness. Fear. Grief. Fear! In order to do my job as guide through this tumultuous Transition, I have to brave the icy waters of this topic. However, I won't talk about the mortal level of things, but the spiritual, Divine's-Eye perspective instead. I hope you can understand what I mean, without getting caught in the world-level drama of it. One of the things that is going on with the Earth these days is what a psychic acquaintance of mine calls "the coming together of all the planes." Some decades ago she saw that this change will make all the lies and delusions impossible to sustain  the truth will finally be seen. That's  visibly  what is going on now. For better AND worse! On a certain level, most societies today believe in fundamental human rights, equality, and caring for others. Yet on another level, somewhat hidden from view, are unsavoury characteristics like self-righteousness, arrogance, and greed. In other words, we speak of equality and respect, and we all want that for ourselves. Most of us want that for everyone. These are powerful ideals. What we (as a society) are acting out, however, is often very different. People often have motives that come from survival-consciousness. And these motives are generally hidden behind self-deception and tricky words. 1 Of course, when we're on the receiving end of one of these patterns, it's painfully obvious! It's only invisible to those who benefit rather than are hurt by it. To the ones who benefit, it seems absolutely normal and perfectly right. 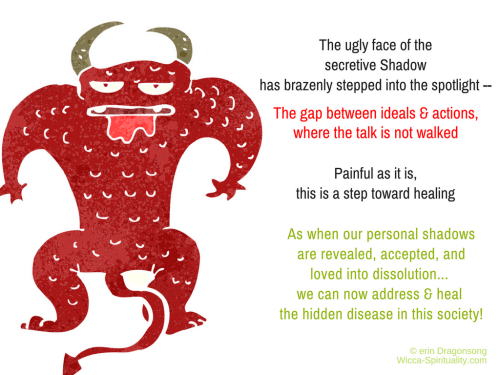 Now that these shadows and fears and underlying rage are coming into the light, we are able to deal with them productively. 2 Please note: I am not speaking about politics. If you find yourself starting to feel emotionally reactive to the topic, it helps to just to notice it, and explore it like an intriguing discovery. What exactly am I feeling? What thought in me made that feeling come up? What makes it live? What is it trying to do? And why? Can I listen more deeply, beyond these feelings, to perhaps learn something new? If you know EFT (Tapping), tap on those feelings/thoughts. A great way to heal and rise above our emotional triggers. Everywhere in each of us that we harbour negative energy, judgements, greed, arrogance, self-absorption, and anything we deplore in someone else. This is not to blame ourselves! Please don't make this a stick to bludgeon yourself, or anyone else, with. It doesn't help to hate our injuries. It helps to lovingly heal them. This is a clarion call from the Earth  for all of us to move beyond hate, fear, shaming, judgement, and all the various ways we seek to separate ourselves from others. When things speed up around you, remember to slow down. This especially goes for your mind! When it starts whizzing around, focus on relaxing your body... and, if possible, your thoughts (meditation is great for that; try drawing or colouring a mandala if your mind just won't slow down). Take deep calming breaths  breathe in through the nose, deep into your belly and pelvis, pause for a moment, and then exhale through the mouth. Nice and slow! Exhale with a descending "ah" sound. This calms your vagus nerve  the body's primary means of communication with the brain. This automatically signals your body to release and let go... and your mind along with it. Imagine you are slowing down to the speed of plant growth. Or like pressing rewind on a video. Slow down till you get right here. Being in nature helps with this a lot. Shake. Yes, like a duck or deer after a near- miss. Shake it out! Shaking is medicine. Learn pendulation: it's switching attention like a pendulum swing, between where you are feeling agitation in your body, and something outside you like a beam of light, the sky, a plant. And the biggest one: Love what arises. Love the anger, the fear, the pain, in your body. Whatever arises, love it. See Matt Kahn for more. 3 If you are a person of colour, I am aware of the limitations of what I am saying here and am sorry I haven't found a perfect way of saying it. Please advise as you feel moved, with gratitude. Like all deaths, there's a period of grieving that's required. When we are forced into grief, it's easy to get angry about it, and/or to fall into denial about it. (Those are 2 of the stages of grief, after all.) Otherwise, it can seem to overwhelming to deal with. Those are healthy responses up to a point  as long as we recognise that these are defense mechanisms and we don't stay stuck in them or in defending them. Breathe through the grief; allow yourself to feel it and know that it  like all things  shall pass. Do what is yours to do; it is enough. © erin Dragonsong 2017. All rights reserved worldwide. Reprinting any of this is forbidden unless you obtain my written permission: karma and the law agree on this one. And Copyscape is keeping an eye on these things.